The fiscal 2018 funding legislation for transportation programs that House funding leaders plan to unveil this week will set the stage for the country’s infrastructure agenda this year. Despite the White House’s calls for slashing Obama-era infrastructure grants and to minimize spending for public transit systems, appropriators will decide what the U.S. Department of Transportation receives for fiscal 2018. Trucking industry executives are hopeful a meal-and-rest break provision finds a home in the House transportation funding bill. The provision would mirror what Senate policymakers approved in an aviation reauthorization bill to ensure uniformity of federal laws and regulations pertaining to meal and rest breaks for truckers. The administration’s push to privatize critical aspects of the infrastructure grid is expected to be rejected in the Senate this week. Senior Democrats in the Senate have been unimpressed by the constant championing of public-private partnerships on the part of senior White House officials and DOT leaders. Transportation Secretary Elaine Chao is scheduled to appear before the upper chamber’s transportation funding panel July 13. She’ll be pressured on details of a 10-year, $1 trillion infrastructure blueprint, full details of which would be revealed this fall, she said at the Aspen Ideas Festival in June. The longer the administration waits to advance its transportation agendum, the more difficult it will get for Congress to consider it. A never-ending investigation of the Office of the President, the saga over health care and the impossible task of reforming the country’s tax code eclipse the desires for realizing a sustainable funding fix for transportation programs. Appropriators see time is running out this year. And notwithstanding the consideration of their transportation bill, they are considering combining the 12 funding bills in what’s known as an omnibus. This massive legislation would be used to avoid a government shutdown in October, essentially making it the most relevant must-pass piece of legislation. Such a bill appeals to lawmakers interested in advancing policy provisions. July 11, 7 p.m.: The House Transportation, Housing and Urban Development, and Related Agencies Appropriations Subcommittee takes up a fiscal 2018 transportation appropriations bill. July 12, 8:30 a.m.: The Federal Highway Administration holds a meeting of the Emergency Route Working Group to develop recommendations on best practices to encourage expeditious state approval of special permits for vehicles involved in emergency response and recovery. 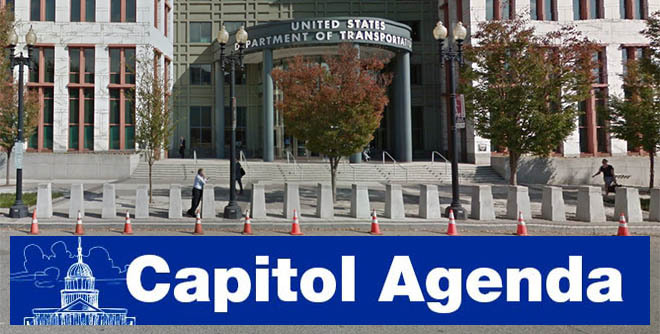 July 12, 10 a.m.: The Senate Environment and Public Works Committee holds a hearing on the Transportation Infrastructure Finance and Innovation Act loan program. July 12-13: American Road and Transportation Builders Association hosts its 29th annual P3s in transportation conference. Sen. Ron Wyden (D-Ore.) and Rep. Lou Barletta (R-Pa.) are scheduled to speak to the group July 13. July 12, 12:30 p.m.: The National Press Club hosts a discussion with Charles Moorman, president and CEO of Amtrak. July 13, 7:45 a.m.: The Ripon Society hosts a discussion with the co-chairs of the bipartisan Problem Solvers Caucus: Rep. Josh Gottheimer (D-N.J.), and Rep. Tom Reed (R-N.Y.). July 13, 9 a.m.: The Brookings Institution hosts the event “Manufacturing Under the Trump Administration.” Speakers include Rep. David Cicilline (D-R.I.); Ray Fogerty, director of the Bryant University Center for International Business; Michelle Drew Rodriguez, manufacturing leader at the Deloitte Center for Industry Insight; Mario Rebello, managing director of government relations at Lenovo; and John White Jr., CEO of Taco Inc.
July 13, 2 p.m.: The Senate Transportation, Housing and Urban Development, and Related Agencies Appropriations Subcommittee examines the Trump administration’s fiscal 2018 budget request. Secretary Chao testifies. CSA REPORT: A decision by federal trucking regulators to adopt sweeping recommendations of an academic panel’s study assessing the way truckers are safety rated has been mostly well-received by the industry; yet some truckers admit they are a bit baffled by the complex “item response theory,” or IRT, approach to revamping the federal Compliance, Safety, Accountability program. EARNINGS: The truckload industry continued to struggle in the second quarter, and earnings are expected to be down year-over-year for most carriers based on forecasts from industry analysts and interviews with several fleets. PANAMA CANAL: Fresh from a $5.25 billion, nine-year expansion that’s upending decades-old trade routes, it turns out the Panama Canal also is doing a little good for the planet. Transportation policymakers in the House are planning to hold a hearing on a recent report of the Federal Motor Carrier Safety Administration’s Compliance, Safety, Accountability scoring program. — Adam Rush, public involvement coordinator at the Idaho Transportation Department, in a note to Transport Topics on July 6. COMPASS, or the Community Planning Association of Southwest Idaho, is an association of local governments that plans the outlook for the state’s Treasure Valley. State DOTs have to reapply for federal freight infrastructure grants under the Trump administration. The International Bridge, Tunnel and Turnpike Association celebrates the tolling system between New York City and New Jersey. This month, repairs at New York Penn Station have resulted in nightmarish traffic conditions for commuters in the Tri-State.